Finn and Lake were the extremely happy recipients of toy bows and arrows for Christmas. The good news is, before we venture too far into this tale, that we still have eight eyes between the four of us. The even better news is that these arrows were a massive hit with our adventure seeking young duo. 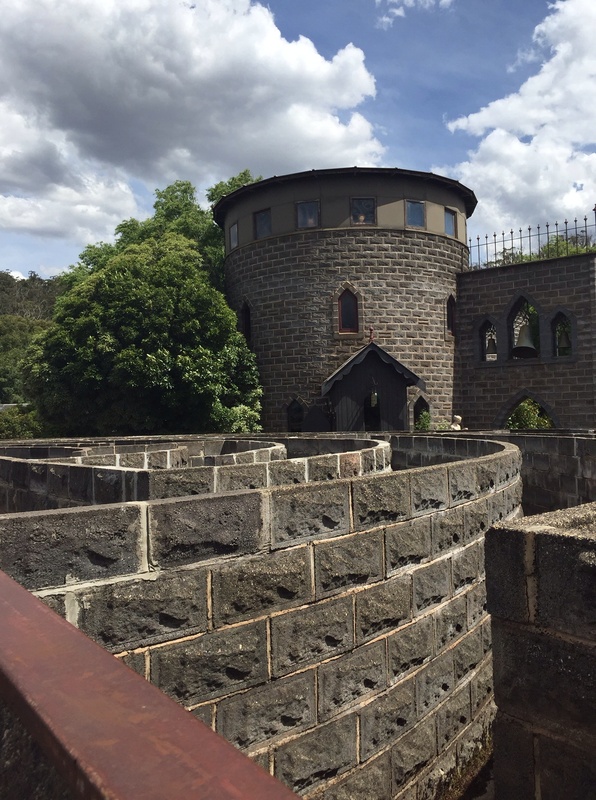 Before descending on Bright, VIC where our bow and arrow frenzy has reached full throttle, we were camping in the lovely town of Ballarat at a family friendly Big4 there called The Windmill – run by what must have been the nicest staff in Victoria. 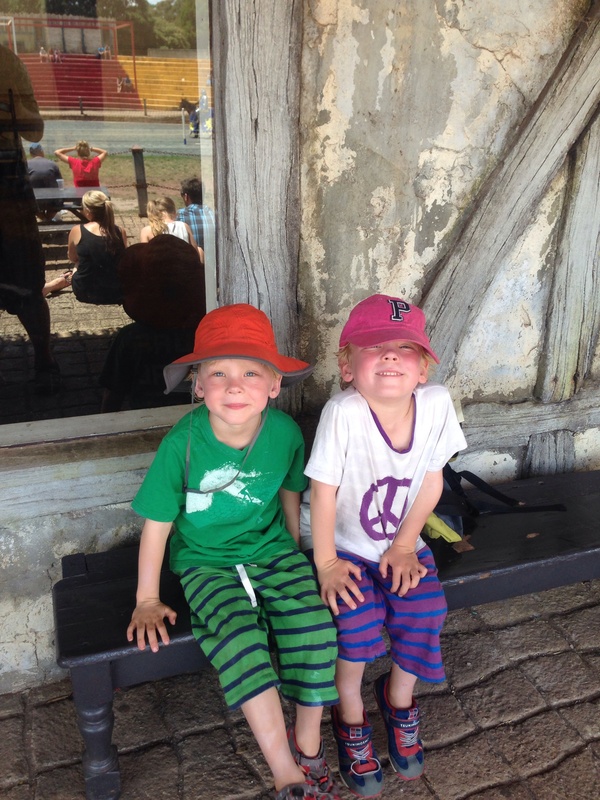 Outside of Ballarat I had the pleasure of taking Lake and Finn to Castle Kryal, which was the kind of adventure that made me once again think how lucky I am to be a father of adventurous, imaginative twin boys! 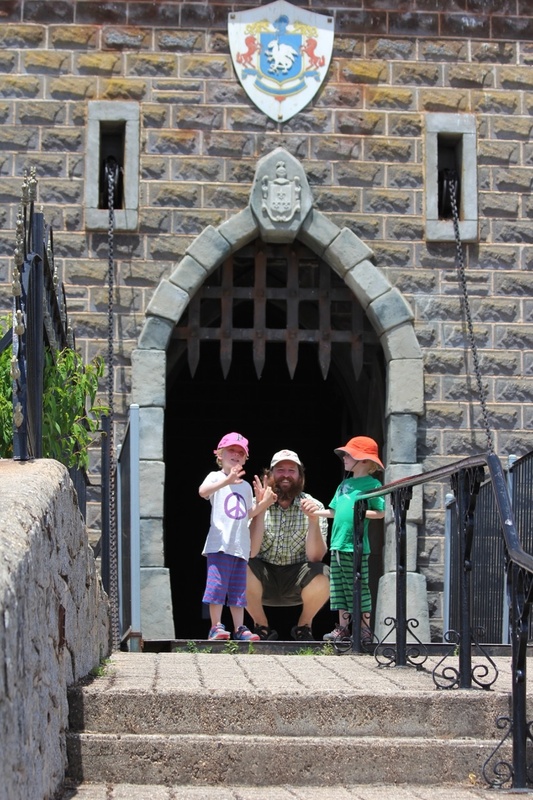 We got the idea for going to Castle Kryal from Matthew, who had a set of toy knights and dragons, and enthusiastically recommended it! Kryal is a very kid friendly castle set in the style and dress of Arthurian Legend. Lake and Finn were the perfect age for this, with activities that included a lifesize maze, a wizard’s workshop, a playground shaped in the form of a castle, and of course a live jousting tournament. The kids are SUPER into lifesize mazes and we’ve been fortunate enough to come across a few recently (including an amazing one at Adventureland in the Riverlands, which leads you to a playground when you find the center!). Fortunately I had the key to this maze, courtesy of the “wizard’s apprentice” so I didn’t mind venturing in and letting Lake and Finn run wild despite the midday heat! I would highly recommend this maze because once you find the center, there is a quick path out and you’re free in thirty seconds. A nice looking castle maze! Castke Kryal was loads of fun and we searched every bit of it – except the “torture chambers” -which were definitely targeted towards older kids…. Plus, I like to avoid torture chambers whenever possible. Our adventure began with a history of Castle Kryal that included an animatronic dragon in the style of Showbiz Pizza and a gripping tale of magic, intrigue and drama. Then we headed outside, where our gallant young five year-olds faced their destiny, stepping up to the legendary sword in the stone. Try as we might, none of us could pull it out. Alas, the Albanys are not the rightful heirs to the throne of England! Without question, the highlight of the afternoon was the joust. The joust was the perfect mix of excitement without too much violence. It also included theme music well-suited for parents of my generation. As the knights prepared their steeds and lances, an emcee of sorts – still in period dress – announced that we all needed to rise before commencing the joust to listen to the national anthem of Kryal. What song was this? Picture kids, period-dressed actors, parents, and a smattering of black T-shirted medieval times enthusiasts rising to stomp their feet to We Will Rock You as the knights entered the arena. Fortunately, the mead was flowing – this was still Australia after all. Then each knight circled the arena, raising their shield and lance to elicit crowd support. And yes, both Sir Baldwin the Lionhearted and Sir Godfrey the Blue brought theme music. Sabotage by the Beastie Boys and whatever that song is from the early naughts (or perhaps late 90s?) that goes like this: “I’m the fire starter! I’m the fire starter!” to screeching but somehow pleasing fast-paced dance music. (Fact checking has revealed this *song* was by an outfit called the Prodigy). Lake and Finn were enthralled. Their mouths dropped open. Those were really horses. Those were really lances. This was really a joust. Dust rose in a cloud as the knights gently kicked their steeds into action. A roar from the crown sounded as lance smashed upon shield. The Lion knight won, raising his shattered lance in victory, and making Lake happy (he loves lions). And after the joust there was a melee of sorts, in which one knight fired arrows carefully into another’s shield. Both boys had smiles from ear to ear as the arrows were let fly! Hey there Brooklyn crew, happy new year, love following your adventures, what a great experience you guys are giving the boys .. Safe travels for 2015 ..
Jay- I bet your smile might have been even bigger than the boys! Ben and amina would have loved every minute of this adventure. Sounds almost too cool to be real.